Therapeutic ultrasound uses high frequency sound waves to stimulate tissue beneath the skin’s surface. This is a method of deep heating which increases blood flow and reduces swelling and edema. Muscle spasms and scar tissue can be reduced. Muscles often relax and can be stretched further following ultrasound. Ultrasound is employed for soft tissue injury and for post surgical stiffness. 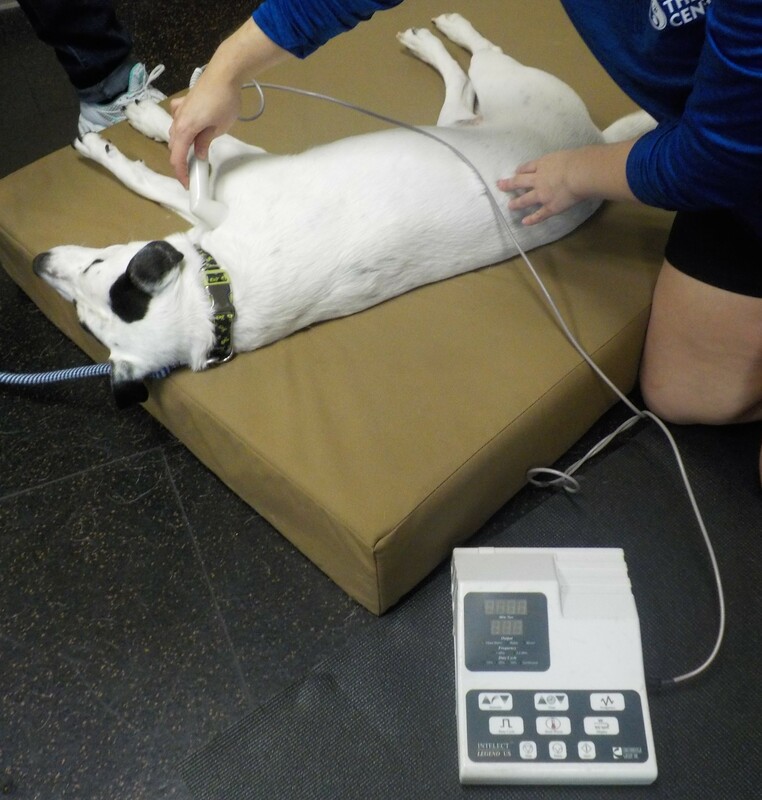 What is E-stim most commonly used for pets ? The purpose of e-stim is to improve muscle memory and strength. This modality uses electrodes and a low electrical current to stimulate nerves at the nerve-muscle junction, causing the muscle to contract. It can be used to increase range of motion, stimulate atrophied muscles or relax muscle spasms. It is often used in paralyzed patients to electrically stimulate nerves. Does my pet’s fur affect the E-stim treatment? 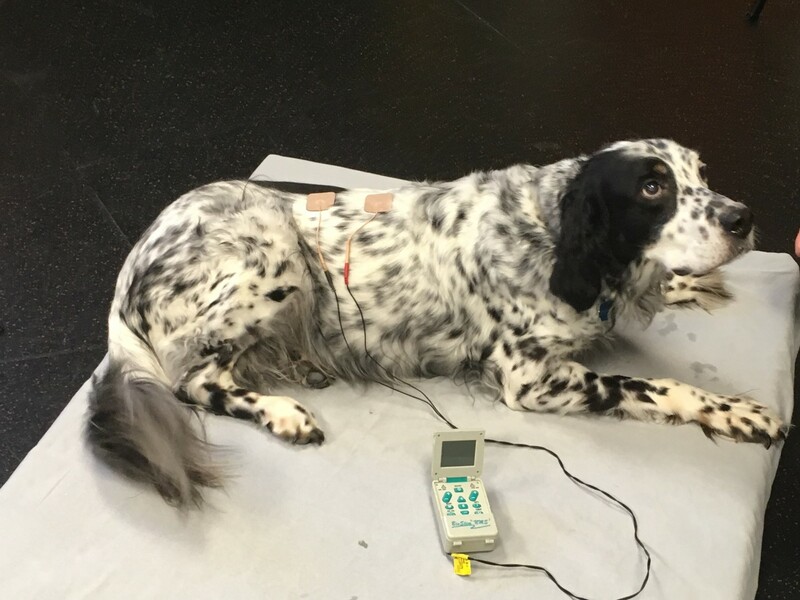 E-stim is most effective if the probes are applied directly to your pet’s skin so dogs with longer hair coats typically will need to have their hair clipped in the treatment area. A gel medium is also applied to your pet’s skin and the electrodes to facilitate better conduction of the electrical current/treatment. Pets with short fur may not need to be clipped. Does my pet feel anything during the E-stim treatment? Does it hurt? This therapy uses electrical pulses to stimulate muscle/nerve activity. While most pets do not feel true pain with this treatment, sometimes the pulses themselves can make some pets unsettled. In humans, the treatment has been described as a “pins and needles” feeling or having the sensation that something is crawling on your skin. Not every patient will tolerate this therapy. Our veterinarian will best decide if this is a beneficial treatment for your pet. What is the purpose of pet massage? 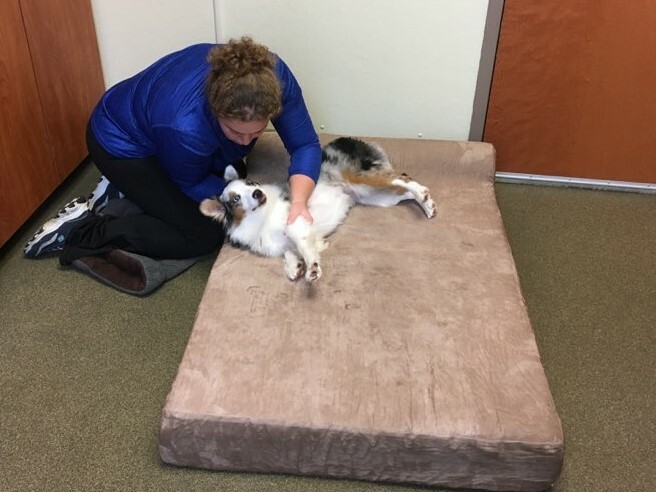 The Purpose or pet massage is to increase muscle length, flexibility, and range of motion. Manual or manipulative therapy involves the therapist applying hands-on techniques to achieve beneficial movement of joints and muscles. Some techniques that we use are: massage, trigger point therapy, passive range of motion, stretching,and joint mobilization. Manual therapy works together with other approaches used in the rehab program to increase circulation, reduce pain and improve function. Changes in nerve input and transmission caused by the manual work are thought to underlie its effectiveness. Postoperative healing, aging or arthritic dogs, and orthopedic problems particularly benefit from this “bodywork”. Athletic dogs also need regular stretching to prevent performance-related injuries. 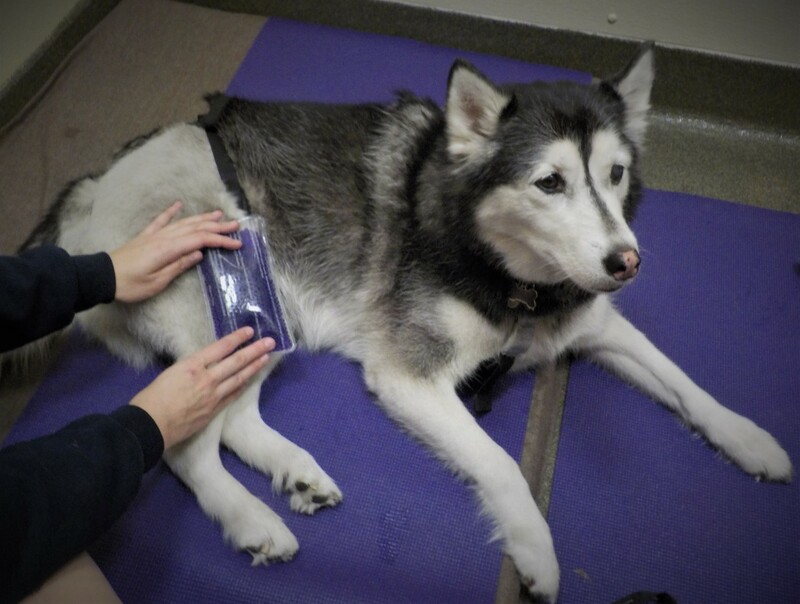 Cold therapy is used to decrease inflammation and pain due to trauma or surgery. Cold reduces the delivery of pain messages to the brain. Heat therapy is used later in the healing process to increase blood flow and flexibility. Heat is especially soothing to arthritic patients.